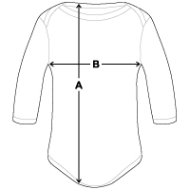 Organic Longsleeve Baby Bodysuit is in stock. We will print it as soon as you order it. I love the product. The material is lovely and soft. Unfortunately I am unable to answer the question above as the baby is not born yet, but I am sure it will fit perfectly. the baby grow is fine but the colour was shocking the quality is no where near what it looks on your site. i'm assuming that's why you don't want anyone mentioning the print "Tell us what you think about the product (and not the print)." Really great quality and the perfect image. So happy with the detail to the designs I chose when ordering the product, the baby is due soon so I will let you know about the fit and if it lasts in the wash! Move over Gordon Ramsey, there's a new chef in town! Get some gourmet style with this little lass. Original, fun and creative Tee shirt designs for kids.